An analysis of public records obtained by the Guardian shows that Pinellas County’s transit agency, PSTA, has not cut bus service since the defeat of Greenlight Pinellas, despite a written promise to do so. PSTA’s top leadership did not respond to multiple requests for comment on these findings. The data obtained shows that the number of bus “revenue miles”, a widely used industry measure, actually increased year to date by 0.1% from Fiscal Year 2014 (FY14) to FY16. A comparison of FY14 and FY15 records shows that bus revenue miles, another widely used industry measure, increased by 0.8%. This data stands in stark contrast PSTA’s promise to cut bus service by at least 18%. During the 2014 Greenlight Pinellas campaign to increase the sales tax by 1%, PSTA said it would cut bus service “18%-28% in 2017” if Greenlight failed. Greenlight was subsequently defeated in November 2014 in a landslide at the ballot box, with 62% of the voters saying NO. In a newspaper insert distributed by PSTA to the general public shortly before the referendum, PSTA even claimed that the “bus service will need to be cut up to 30% in order to balance the budget.” No timeframe was given for when the cut would take place (see image inset). Because public funds were used to promote the Greenlight Pinellas plan to the public, Florida Statutes 106.113 (2) required PSTA to limit their electioneering communications to “factual information.” Therefore, their statement about service cuts if voters said “NO” can be viewed as a promise to voters. Or a threat, if that is your point of view. In 2010, PSTA sought an opinion from the Florida Division of Elections, asking “what kind of factual information” it could provide to voters. The response was that the Division “interpret(s) the statute to limit your expressions of “factual information” to verifiable actualities.” It remains to be seen if the cuts that voters were promised/threatened will actually and verifiably be made in 2017. The bus service data obtained raises questions about what draconian cuts PSTA will have to make in its next fiscal year if it’s to keep its promise/threat to voters. PSTA’s 2017 fiscal year begins on October 1, 2016. The Guardian contacted Brad Miller, CEO of PSTA (shown below) on May 4th and asked for a comment on the absence of service cuts. We specifically asked if “if PSTA intends to honor that promise” to cut service on poorly performing routes, thereby saving taxpayers money. Miller did not respond. The Guardian then e-mailed PSTA board chair Darden Rice and vice chair Julie Bujalski at noon on Friday May 6th and said “if you have any comments for publication, we are happy to receive them.” However, neither Rice nor Bujalski responded, nor did Miller, who we also copied on our second e-mail. At 8:01 A.M. the next morning, Saturday May 7th, PSTA sent out a mass e-mail announcing public workshops on “October service changes”. None of PSTA’s 50+ previous mass e-mails sent out over the last two years were sent out on a Saturday. PSTA’s offices are closed on Saturdays. The mass e-mail notice went out just three days before the first workshop, and the notice invited people to “read about proposals” on PSTA’s website. Athe time of publication of this, no proposals could be found on the PSTA website, only the workshop schedule. 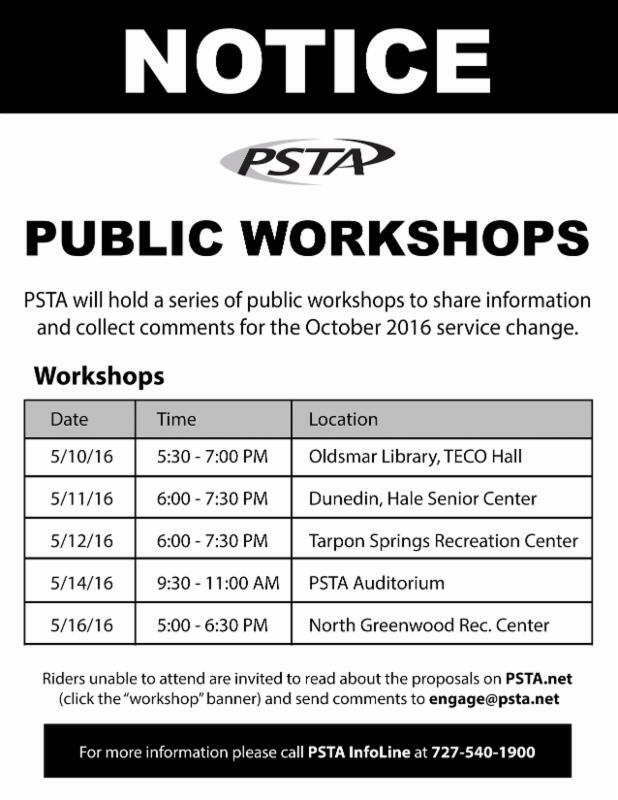 PSTA says that they are conducting “a series of public workshops to share information and collect comments for the October 2016 service change.” However, a former PSTA board member who did not wish to be named said that citizens are unlikely to attend workshops with such a vague description of the topic for discussion. PSTA’s goal may be to suppress public engagement at these workshops by taxpayers demanding service cuts, while encouraging input from others demanding that service levels be maintained. The Guardian will make further public records requests to find out how the workshops were planned and discussed internally at PSTA. The PSTA board has a history of not cutting the worst performing bus routes if people show up at their meetings and demand that a route be kept. Last year, the PSTA board went against staff recommendation and kept route 444. This route only has 22 passenger boardings per day and is by far PSTA’s worst performing route. Barb Haselden, who led the grassroots No Tax For Tracks effort to defeat Greenlight Pinellas in 2014, said she “already knew that bus service had not been cut.” In her view, PSTA is a wasteful organization and a very poor steward of public funds. Largo Commissioner Curtis Holmes, a former PSTA board member, said that PSTA is a “malfunctioning cesspool of squandered tax dollars.” Holmes served one year on the board and gave one of the most negative performance evaluations of CEO Brad Miller. Holmes was also one of the few board members who wanted to fire Miller. Miller may also not be happy with the overall direction of PSTA. Earlier this year, he applied for the top job at Lynx, the Orlando area transit agency. Ultimately, Lynx settled on another candidate. Analysis of data obtained in another public records request by the Guardian showed that PSTA’s expenses on diesel fuel fell by 39% in the first quarter of 2016, compared to the same time last year. PSTA will save approximately $2.7 million year over year, which is 4.3% of their total FY2015 spending. Despite these large savings on fuel, PSTA’s adopted FY2016 operating budget shows an increase in spending of 4.1% over the previous year. PSTA has increased spending in several budget categories by 22% – 25% as diesel costs dropped. Spending on “fringe benefits” are up 7.5% compared to last year and now make up 17.5% of PSTA’s operating budget. 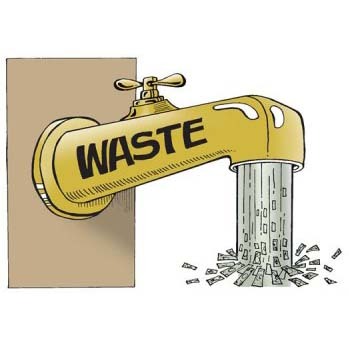 Spent on fringe benefits is more than twice that spent on diesel fuel. Adding to future costs, PSTA signed a generous 3-year labor union agreement in March. The contract will increase payroll costs by over 4% per year for 2016 through 2018. Before voting to approve the contract, Chairwoman Darden Rice said “I feel like applauding” followed by soft laughter from board members off-camera. County Commissioner Ken Welch asked why all employees could not immediately be brought up to at least $12.50 per hour (plus benefit). No other board member had any questions about any aspect of the union contract. The board vote to approve the union contract was unanimous. Next Post “Welcome aboard” means “you’re unhired” for that job you got. Seriously?